This weekend includes a Christmas concert at The Bradbury, KROQ’s Locals Only, a huge winter festival in Studio City, a Pet Winter Wonderland at the LA Convention Center, the Marina Del Rey Boat Parade, and much, much more! Nat Geo paleontologist Nizar Ibrahim gives a live talk backed by amazing video recreations of the Cretaceous Era Sahara to help tell the story of the largest predatory dinosaur ever discovered: Spinosaurus. The event runs two days (this Thursday and Friday) at the Broad Stage in Santa Monica, but our friends at Goldstar have special discounts to save around $20 for Friday’s show. Joseph Young’s six-story, 60-ton public artwork Triforium is turning 40 this month, join The Triforium Project for a picnic, DJ sets from dublab, history tours, special speakers and free birthday cake, courtesy of Charm City Cakes. Catch electro artist Lights along with The Mowgli’s and special guest K.Flay as part of KROQ’s Locals Only performance at The Wiltern Theater this Friday night. Doors open at 5:30pm, show begins at 6:30pm. Tickets still available via Livenation. The Queen Mary will once again be overtaken by a deep freeze for the fourth annual CHILL! Experience the Ice Kingdom, glacier glide ice tubing, ice skating and plenty of holiday entertainment. P.S. The Ice Kingdom will be introducing the New Holiday Ice Bar for adults! For more information and discounted tickets seven days a week, visit our friends at Goldstar. Christmas is in full effect at Knott’s Berry Farm! Charlie Brown and friends are the theme this year. Watch Snoopy dance on ice in the “Merry Christmas, Snoopy!” show and Chuck celebrates the holiday with the Peanuts gang in the live show “Christmas Time Is Here, Charlie Brown.” Our friends at Goldstar is offering discount ticket packages all throughout the month! Whimsic Alley’s 6th annual Yule Ball will take place this Friday in their Great Hall. Festivities begin at 8:00pm and will continue on until midnight. Dinner, dessert, and an open bar are included with your ticket ($70). This event is 18+. LA’s only live animated comedy show is going down at The Virgil. Hosted by Brandie Posey with comedians Matt Braunger, Jamie Lee, Cole Escola, Howard Kremer,Ian Abramson and Jay Weingarten with animation by Ashlyn Anstee, Matt Kiel,Mike Mayfield and Mike Hollingsworth. The event it totally free! Yes, we all know about Urban Lights outside of LACMA but did you know the late Chris Burden’s earliest work was in performance art? Actual Size gallery is pleased to present Locker Number 5, an exhibition about the late artist, Chris Burden by two Los Angeles-based creatives, Jason Keller and James Melinat. The exhibition opens Monday, December 7th, 2015 and runs through Friday, December 11th, 2015 at the Actual Size Gallery. Come experience an exact replica of a locker used by Chris Burden to perform what later became known as his Five Day Locker Piece in April of 1971. A reception will be held on Friday, December 11th from 6:00pm – 8:00pm. 9. The Rink In Downtown Burbank Is Back! Downtown Burbank’s most festive holiday tradition returns for outdoor ice skating and festive events. The Rink in Downtown Burbank will run from December 10, 2015 through January 3, 2016. The Long Beach Museum of Art is free every Friday! L.A. punk gallery KBG is having their second annual Xmas Art Show Friday in Chinatown with performances by cover band Joy Revision, Silver Star, Siggy and first-wave L.A. punk rockers Taquila Mockingbird. Festivities continue Saturday night too. Any Angelenos out there with Ukulele skills? The Music Center is celebrating the holidays with the Ukulele Christmas Orchestra. Amateur Ukulele players 18 and older are invited to perform in the free program! This event is only for those performing, so make sure to RSVP beforehand to earn a spot. 13. Gudetama Extends His Stay At Plan Check Kitchen + Bar! Starting December 11th and running through December 18th (while supplies last), Gudetama will extend his takeover of all three locations of Plan Check Kitchen + Bar in the Fairfax, Sawtelle, and Downtown neighborhoods of Los Angeles. The special Gudetama-inspired menu featuring a variety of egg dishes is created by Executive Chef Ernesto Uchimura, it’s insanely cute and almost too cute to eat! The Holiday Odd Market at FIG@7th will host over 45 vendors of jewelry, fashion, art, vintage home goods and gourmet food this weekend in DTLA. In addition the market will provide plenty of live entertainment including bands, a breakdancing competition and DJs throughout the day. Visit the California Market Center for amazing shopping deals during their Holiday Sample Sale event. Score incredible gifts in hundreds of showrooms carrying apparel for men, women, children as well as gift & home items all way below-retail prices. Cool girl jewelry brand Workhorse is having a sample sale taking place from December 11 (12:00 – 5:00pm) and 12th (11:00am – 4:00pm.) Email info@workhorse.com for location. One of the most sought after sales to hit Los Angeles the Gilt City Warehouse Sale gives lucky shoppers major discounts (up to 80% off!) on brands like Lanvin, Dior, Helmut Lang, and more at Gilt City’s massive warehouse extravaganza. Complimentary wine and snacks will also be provided. The sale runs Friday through Saturday. The Trend Boutique is hosting a massive warehouse sale in DTLA, everything will be priced from $9-$99. In addition, they’ll be running giveaways and promotions throughout the sale dates- check event page for full schedule and details. Now through Sunday from 10:00am – 6:00pm, score up to 90% off apparel, accessories, footwear, and jewelry from designer like Elizabeth & James, Cynthia Vincent, Giambattista Valliand and more during CLD Style House’s summer sample sale at the Bendix building’s 11th floor penthouse. L.A. based burlesque troupe The Dollface Dames take over the Magicopolis stage for a night of tease, balloon popping, belly dance and even clogging? Lets just say they do a lot in their 80 minute show. But the fun doesn’t end there the Magicopolis bartenders double as magicians! Grab half price tickets and spend your money at the bar! Come see Grand Marshal Florence Henderson at the Marina Del Rey Holiday Boat Parade for fireworks, a boat parade and food trucks. Sample confections, sip on crafted cocktails and shop for artesian items at L.A. Weekly’s Sips & Sweets! Now in its second year, the annual holiday party will feature some of the city’s top bakers, LA’s most respected mixologists and some nifty artisanal crafts shopping. Curated by L.A. Weekly’s food critic Besha Rodell and Roxana Jullapat, the festivities will take place at The Reef in Downtown Los Angeles. A Westside holiday tradition the SANTA Monica Pub Crawl will flood the Santa Monica streets with holiday spirit. 30 of the city’s best bars and restaurants on the Pier, Promenade, Main St. and Wilshire Blvd. will feature food and drink specials for crawlers, with a portion of proceeds benefiting the Westside Food Bank. Last year, more than 6,000 people attended, raising enough food for 120,000 meals. The Pet Winter Wonderland is here! Happening Saturday and Sunday at the Los Angeles Convention Center. Admission is FREE and all pets are welcome. Get some holiday shopping done for all your furry friends, there will also be free nail trims, low- cost vaccinations, entertainment, pet photos with Santa, a Mega Adoption Area and much more. The Malibu Country Mart will host their annual Winter Wonderland celebration throughout the month of December. The Mart will be beautifully decorated with festive holiday décor and visitors can enjoy weekly events with holiday-themed activities like strolling Victorian carolers, kid-friendly holiday crafts, cookie decorating, and visits from Santa Claus with real live reindeer! Every Saturday during Holiday Lights at the Getty you can catch a sunset at magic hour, take a stroll through the Central Garden of twinkling tress and stay warm with some complimentary mulled cider. Join Bergamot Station for their Holiday Open House event. There will be live music, free portrait paintings, festive food, holiday drinks and plenty of art. The event is free and open to the public! Enjoy outdoor ice skating at L.A. LIVE! The annual LA Kings Holiday Ice brings outdoor ice skating to L.A. LIVE’s Microsoft Square. The rink will run through December 31, 2015. 26. Sip Cocktails, See The Sights With The Historic Hollywood: Stars & Bars Gang! Get a taste of Old Hollywood and sip on classic cocktails as an awesome guide share history tidbits, celebrity stories and more on Urban Adventures tour of Historic Hollywood. For more information and discount tickets check out our friends at Goldstar. A Current Affair brings together over 50 premier vintage retailers and private dealers from Los Angeles and beyond for a one stop shop for unique and covetable collections. Shop and enjoy an open bar, sway to DJ tunes, unwind in the lounge and nosh on small bites. The pop up will take place at the Cooper Design Space this Saturday and Sunday. The Go Little Tokyo Holiday Marketplace is happening in Little Tokyo this Saturday and Sunday. Enjoy a weekend full of live entertainment, shopping, special promotions and raffles from Little Tokyo’s unique shops. Eat at the neighborhood’s authentic restaurants and partake in art workshops available for all ages. This event is free! Daily Dose is hosting a sample sale for fashion line Shades of Grey by Micah Cohen. Score up to 85% off during the two-day sale (10:00am – 5:00pm.) While you’re there, stop by for a delicious, healthy bite and get caffeinated with some great coffee at Daily Dose. Brace yourself a really big SALE is coming your way! The Saturday Sale at the California Market Center is open to the public with slashed prices of 50 to 80% off tons of contemporary brands. Shoutout to east side yogis! Stop by One Down Dog and stock up on yogi gifts during their Community Shop event this Saturday (2:00pm – 5:00pm) They’ll have local LA vendors showcasing unique goods, a DJ, tarot card reader, a photo booth, kombucha, snacks and a chance to win a year of free yoga! Taking place at DTLA’s Grand Park, the Renegade Craft Fair will feature handmade goodies, DIY workshops, art work by independent makers and more. The fair is happening through Sunday and admission is free! Metro Art Moves is a free series of special tours showcasing the diverse range of site-specific artworks that are featured within the Metro Rail system and it’s totally free! The LA Zoo will once again be transformed into a fantastical wonderland where glowing light animals roam the lands. Check out decked-out animal-themed LED lights, lasers, 3D projections, and spectacular new water, light and music displays. Enjoy holiday treats and goodies, all under the stars. Real reindeers will also be on display down at Reindeer Romp Village and Santa (on select dates) will even make a few stops at the beloved zoo during the holiday. Happening seven days a week! For more information and discount tickets check out Goldstar. 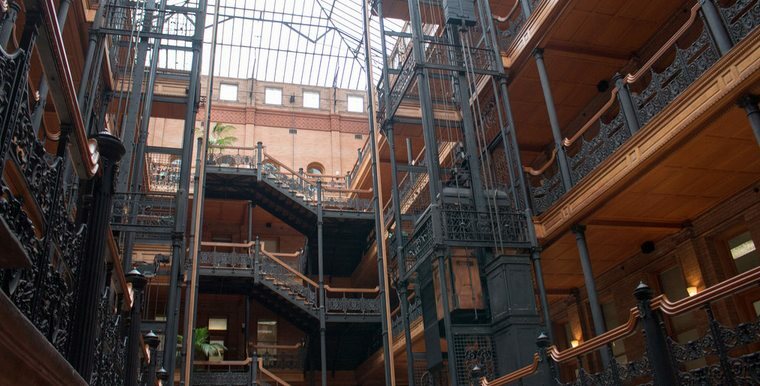 Head over to the Bradbury Building for a special Christmas concert to be hosted inside the site’s gorgeous five-story atrium. Spanish Brass Luur Metalls will perform arrangements of traditional carols and holiday favorites (Silent Night, Joy to the World, etc..) plus excerpts from Corelli’s Christmas Oratorio and Handel’s Messiah along with Vince Guaraldi’s A Charlie Brown Christmas. Tickets for the concert are $65. 70 tons of snow is set to hit Studio City on Sunday durning the Fifth Annual Studio City Winter Family Festival! This man-made winter wonderland will host sledding, snowman making, gingerbread house decorating, craft-making, holiday card making for the troops, photos with Santa, live music, dancing and so much more. Come Celebrate the 50th anniversary of The Sound of Music with a free screening at the Hammer Museum in Westwood. The Billboard Creative will place 33 contemporary artists’ works on billboards across Los Angeles displayed at major intersections throughout the city. The first billboard display will go up on December 1 with plans to have all the rest installed by December 7. The works will be up for one month only. Free admission to Pacific Asia Museum this Sunday! The Museum of Latin American Art has free admission every Sunday! The super fun ornament sale returns to gallery iam8bit. Artists from around the world have crafted hundreds of original ornaments all starting at an affordable $10. Happening now through December. From November 12 – January 18 Angelenos can skate in the heart of DTLA at Pershing Square. Each skate-session costs $9, and it’s $4 for skate rental. Every Sunday it’s pay what you can day at the Craft and Folk Art Museum. Master Tea Blender Steve Schwartz from the LA-based, hand-crafted tea purveyor, Art of Tea, will be leading a tea blending workshop showcasing how to forage native SoCal, drought-resistant plants to create tea blends. The interactive workshop will take place in the Natural History Museum’s edible garden, and attendees will have the opportunity to customize their own blend to take home. The Village at Westfield Topanga will be holding a special Santa photos with pets session this Sunday from 10:00am – 1:00pm. A donation of $5 or more is suggested to St. Jude’s Children’s Hospital. Additional information can be found by visiting the official Westfield Topanga Facebook Event page.